Dylan would rather be a normal teenager than have Tourette’s, would rather have Dad home than away with the Army, and would rather live past March than get intimate with Michelle – scratch that last item: he wants to live and be Michelle’s boyfriend. 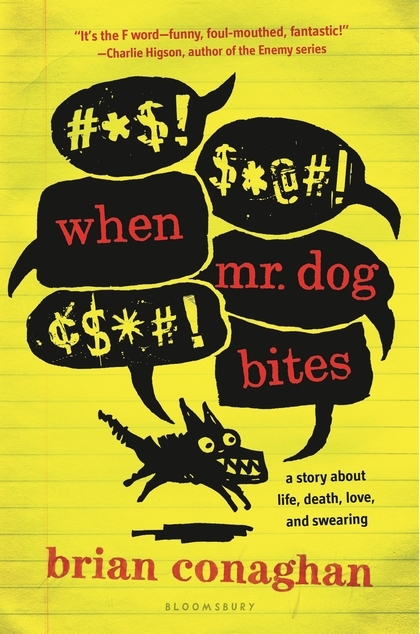 Filled with involuntary creative swearing from Dylan and racial slurs by his special school classmates, When Mr. Dog Bites has raised eyebrows for its strong language, but is also raising awareness of living with Tourette Syndrome like its author does. This funny and profane book was published in the US in June – will Dylan fulfill his bucket list before it’s too late? Book info: When Mr. Dog Bites / Brian Conaghan. Bloomsbury, 2014. [author’s Twitter] [publisher site] [video interview] Review copy and cover image courtesy of the publisher. My book talk: When he misunderstands a doctor’s comment, 16-year-old Dylan lists things to do quickly before he dies – and he’s not letting his Tourette’s or the crazies at his special school or that taxi driver stop him! Inside Dylan is “Mr. Dog” the uncontrollable side of his Tourette Syndrome which causes the Scots teen to bark and swear. Special school, meds, and counseling help a bit, but Dad being away on special Army duty and Mum getting all weepy with the taxi driver don’t. The tics, swearing, and blackouts permeating every moment of Dylan’s life despite his deep desire to behave normally reflect the author’s own struggle with Tourette’s in this forthright novel. ← Green Teen Cookbook – book review & giveaway!